Indulge and get something beautiful with these crystalline Acrylic Desk Blocks. They make a perfect gift to show someone how much you care. The 1 inch think acrylic has engraving available on both the front or back. Order them with one or two lines of text and add a logo to show your company pride. Both blocks are clear, but the black block has an opaque coated back which changes the appearance of the color of the acrylic. You will receive a digital proof showing your design. This proof must be approved before production on your product will begin. Most orders will ship within one to two business days. Trust us with your personalized identification needs and we'll guarantee your satisfaction. 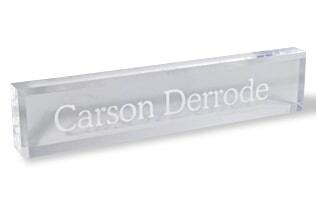 With one or two lines of engraving, everyone in your office will treasure these Acrylic Desk Blocks and be proud to display them in their office. Choose from white, gold or silver to fill a front engraving choice to add more depth to your new name plate. Available in both black and clear and two sizes. All text will be engraved on the front or back surface. A colored fill is available for front engraving. Quantity, size and selected options may affect the price. Prices range from $31.99 to $35.99 each. Add a logo to your Acrylic Desk Block to show off your brand. With one or two lines of engraving, these will look perfect on anyone’s desk. Choose from white, gold or silver to fill a front engraving choice to add more depth to your new name plate. Available in both black and clear and two different sizes. Add an engraved logo with one or two lines of text; requires a $10 set-up fee (initial order only). Quantity, size and selected options may affect the price. 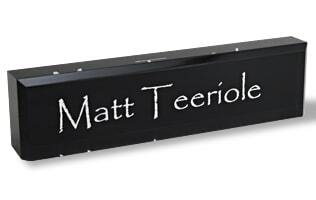 Customize high-quality metal and plastic name plates with your name, title and optional logo. The most popular style of name plates, classic name plates are available with the following holders: metal wall mounts, metal desk holders, plastic desk bases, cubicle hangers and a variety of name plate adhesives. Name Tag, Inc. carries a wide selection of name plates. If you don't see what you want, give us a call and we'll help you find it. Large selection – Low prices! Pricing includes one desk block (black* or clear) with one or two lines of engraving and an optional logo ($10 set-up on first order). 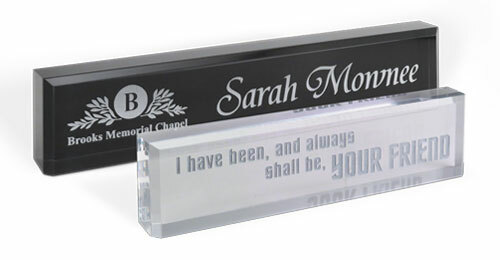 Desk Blocks with front engraving may have the engraving filled with silver, gold or white fill. *Black Desk Blocks are clear with a black, opaque coated back. Front engraved text and logos may be filled with gold, silver or white to improve the contrast of the engraving. Front engraving results in a solid look while back engraving results in a reflective look. Engraved text and logos may be filled to improve the contrast of the engraving.